Get a whole bunch of magic square puzzle worksheets here! 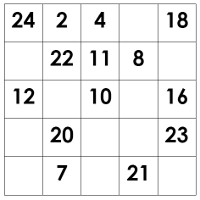 If you are looking for printable magic square puzzles, you need look no further than this page! I've provided almost 30 magic square worksheets in pdf format - with forty magic square puzzles, all the way from a bunch of simple 3 by 3 puzzles, up to a whopping great eight by eight! While you're downloading them, you might also like to check out the Magic Hexagon Worksheet Generator elsewhere on this site. How can you use them? Well, if you just like solving puzzles, then grab your pencil (and an eraser!) and solve away! Fill in the grids with numbers according to the instructions. If you are a parent or a teacher, you could use the worksheets as follows. in fact, the solution is always the same, except maybe flipped or rotated. This is not surprising - there is, after all, basically only one three by three magic square. each solution is basically a different magic square. This is not surprising - there are actually 880 different four by four magic squares, but they all have the same "magic number". Then, let the enthusiastic loose on the 6 by 6, 7 by 7 and 8 by 8 puzzles! Anyway, I hope this collection of magic square worksheets puzzles provides the kids in your care (or you!) many hours of magic square puzzle fun! Or, if these are not enough, elsewhere I explain the steps I used to create these magic square puzzles!